Discussion in 'Rugby League Forum' started by Disco, Jan 29, 2016. The commentators on nein who called it were just as astounded. But they didn't go on about.. They just went quiet and let it go. Bunch of pussies.. Isn't it St paddy's day in Straya? Why aren't you all making drunk posts? ideline him for up to three months. Tupou suffered the injury while attempting to put pressure on a Kieran Foran kick in the first half of the Roosters' round-two win over Canterbury. Penrith Panthers winger Dallin Watene-Zelezniak won’t undergo full surgery but will be sidelined for at least a month after suffering a broken jaw in the win over the South Sydney Rabbitohs on Saturday night. The speedy utility back will need dental work and a small splint inserted into his jaw and is looking at 4-6 weeks on the sidelines. Rubbish! Fumed Gus gould when asked about the dogs v penrith being at 6pm on a friday when 11k turned out. Why did they schedule the game then? No one can get to it. Journos happy to lap it up but when it is a Manly game.... "manly fans don't travel" cry the galactically stupid. This Joel Thompson is an impressive man. Manly forward Joel Thompson wants to take the two supporters sanctioned for abusing South Sydney Greg Inglis to an indigenous community. He wants to give them some semblance of understanding of why their comments cut not just Inglis so deeply, but every indigenous footballer in the NRL. He says enlightenment rather than retribution is the key. “For those two guys, it’s disgraceful but I hope they get some education,” Thompson said. “I will take them out to do some community stuff with them. That would open their eyes up. It’s more ignorance and no education. 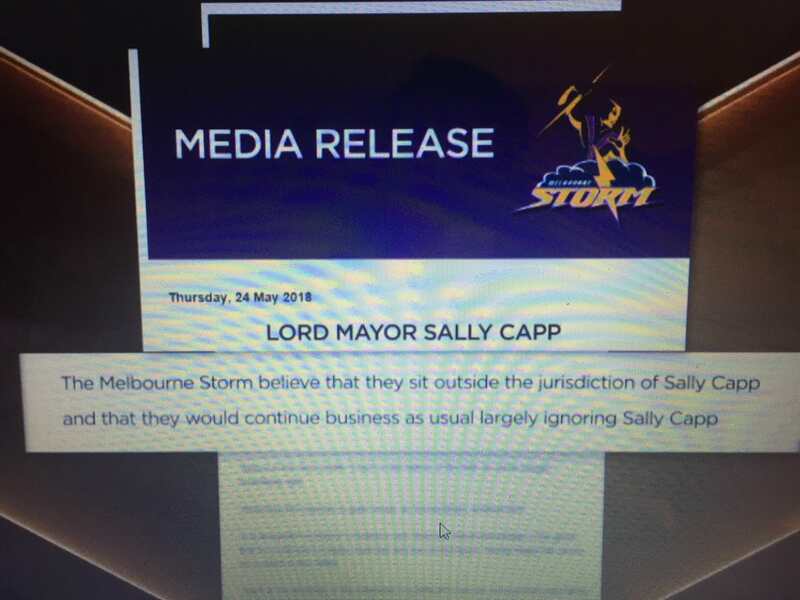 Many want life bans to be brought against the pair responsible for comments which outraged rugby league fans across the game, regardless of their background. Thompson would rather see them rehabilitated, just like so many players who do the wrong thing but then get an opportunity to prove they have changed their ways. What a great human, well done Joel. ROOSTERS supremo Nick Politis and new NRL independent commissioner Peter V’landys having brekkie in Rushcutters Bay on Thursday. AUSSIE man mountain Jordan Mailata has found a home at an NFL franchise after being selected in the Draft despite never having played a single down of American football. This year’s Super Bowl winners the Philadelphia Eagles scooped up Mailata on Sunday morning (AEST) in the seventh round with pick No. 233 overall. Be great to keep an eye on him. Who said newspapers sensationalise !! ROOKIE AJ Brimson’s rise in the Titans No. 6 jersey could force local product Kane Elgey out of the Gold Coast. Brimson will tackle the Roosters in Gosford on Saturday after retaining the five-eighth duties for the third straight match. The 19-year-old has made an impressive start to his NRL career, and scored the matchwinning try in the Gold Coast’s comeback win against Newcastle last weekend. from the DT rolling coverage. And Elgey...who some on here wanted everything thrown at him. I was never keen on Elgey being encouraged to come to Manly at the time of the D C E retention sage , definitely Ash Taylor though . A bit fragile in defence but still has some talent and half back seems his best position . Tough business sometimes to get a regular gig in the N R L and not too sure what other clubs may want his services in the short term but if he says dedicated , no doubt he will still get some opportunities down the track . Parramatta will approach the NRL about the possibility of medically retiring veteran forward Beau Scott after he suffered a season-ending knee injury against the Warriors last week. The Eels will ask whether the ruptured ACL, that is expected to bring an end to Scott's career, is classified as a career-ending injury. If the NRL deems the injury to be career-ending, it would give the Eels significant salary cap relief. Scott is on a back-ended deal with the Eels worth in excess of $600,000 for this season and given there are more than five months remaining in the rugby league calendar year, Parramatta may have $300,000 extra to spend if the injury is deemed to be career-ending. Hey all need some advice - I just got tix for soo2 in the blatcys blues section - allegedly there are the wigs/T-shirt included in the price. How do you get them - can’t see any info on how to collect them? Darius Boyd has become the latest player to walk away from representative rugby league, following in the footsteps of Cameron Smith, Johnathan Thurston and Cooper Cronk. ‘’My time’s done in rep footy,” Boyd told The Courier-Mail. “I’ve had a great career. I have nothing to be disappointed about. I’m really happy with everything I’ve achieved in the rep arena.